In the 13th and 14th century the Mongol Empire was burgeoning, and the Mongols in the midst of war needed to ensure they had open lines of communication in all situations. Because of this need for communication across their wide spread forces, the Mongols employed various methods to keep the key Mongol military figures informed. The Mongol lines of communication were in fact so good they set new precedents for speed, quality and service levels. In ancient times where trust and services were not often associated with message systems, the Mongols produced the most effective long distance, and high speed message system. The idea that war often creates new services was completely true with the Mongol war communications. The system that was created specifically for the Khans and large unit leaders to communicate while at war at long distance, eventually turned into a service that merchants, traders and all other types of people piggybacked onto. The first most important system of communication was the Mongol messenger relay system which we will explore more, this was called the yam. The Mongols communication was so effective because it was powered by a Mongol supply or message route, known as a yam. A yam in Mongol times was essentially a system of relay stations used by the Mongol riders to transfer messages quickly and effectively, and the yams were their long distance communication system. 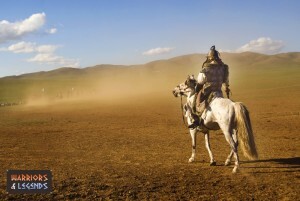 A Mongol messenger preparing to make their journey to the next yam, the relay stations used by the Mongols. The way the yam worked was simple. The first messenger would travel by horseback to the nearest yam, from here the next messenger already stationed at the yam would now take over and travel to the next station, and the original rider could rest and recover from their journey. This relay system ensured that the Mongol messages and communication were handled with amazing speed. The yam stations themselves were kitted out with supplies and resources for the weary messenger. Here the rider would have access to food and supplies, new horses and would offer them a place to rest and sleep. To be a Mongol messenger mean’t you had to be willing to ride like the wind, to travel long distances without rest and sleep. Respite would be offered at one of the yams if you were travelling a route populated by them. Mongol messengers would often swap horses at villages, towns or yams, ensuring they could ride non stop for hours. On arrival at a town or settlement a Mongol messenger was treated with high respect, such was the importance of the message system. Because of their speed these horseback messengers would often be called by the nickname of ‘arrow messengers’. 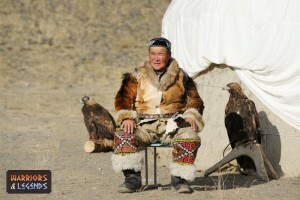 A Mongol waiting at a yam, preparing himself to relay the message to the next station if needed. Communication on the battlefield was of course less straight forward than the messenger system the Mongols operated. The Mongols employed various methods to keep things in order on the battlefield, flags systems, audible signals like horns, kettles and battle drums were also employed. Messenger arrows were also used by the Mongols on the battlefields. Legends tell that messages were tied to arrows, fired from unit to unit until they reached their intended target. It was through that this messenger system made implementing complicated battle plans possible, giving the edge to the Mongols over their foes. One of the keys to success for the Mongol armies was its use of communication. The Mongols battlefield tactics were of the highest order, and this was in part due to their ability to communicate. Whether messenger arrows, their flag and banner system or the old horn, the Mongols were masters of battlefield communication.